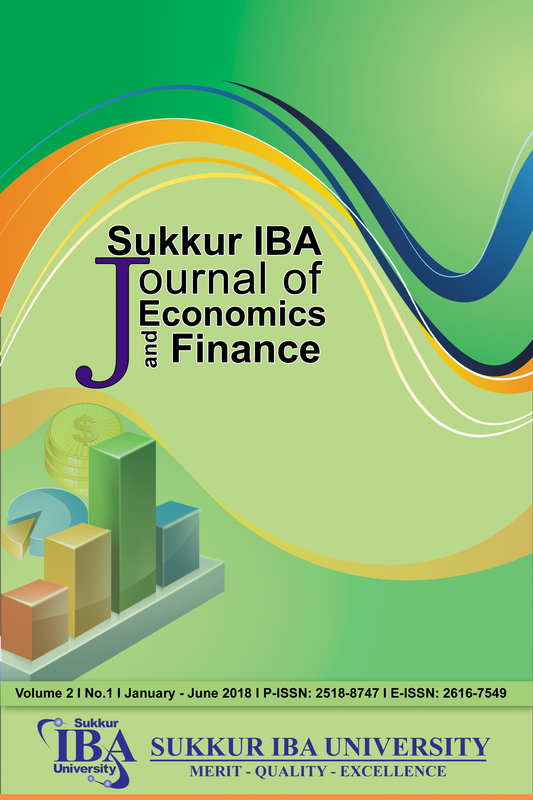 The First issue of Volume 2 of the Sukkur IBA Journal of Economics and Finance presents a diverse pool of empirical research papers in the field of economics and finance. This issue focuses on examining the financial performance of the financial institutions of Asia, investigating the financial development and economic growth nexus, determining the link between poverty and economic development, investigating nature of risk involving trade credit by non-financial businesses, finding ways to select the optimal portfolios for Pakistani investors, and assessing the behaviors of investors in Pakistan. The first paper finding suggests that nationality and age diversity are related to financial institution (FI) performance. The FIs profitability improves when executives and board members have varied experience and if they are young. Further, authors expand their investigation and conclude that there is no significant role of gender in the improvement of FIs performance. Pakistan faced poor economic conditions from very start in 1947, was able to sustain economic growth of 5-6% in the 1960s, then continuous political turmoil of 1970s and 1980s and lawlessness and terrorism of 1990s further degraded development of the economic and financial sector. The poverty made deep roots and become an obstacle to the stability, prosperity, and development of the economy. The second paper explores the connectedness between the financial development and economic growth in Pakistan during 1974 – 2014 period. Our third paper also looks into the nexus between Pakistan’s poverty and economic development during 1994 – 2015. This paper employing extensive econometric techniques try to explain the channels through which poverty reduction may trigger economic development. The developing economy like Pakistan continuously faces the financing constraints due to poor economic conditions since inception. The impact of poor economic development is also visible on economic and financial sectors making it a case for research to authors of our fourth paper. Their paper investigates the behavior of non-financial firms towards the use of trade credit keeping the borrowing constraint in view. They identify the increased risk for to borrowers of bank and use of trade credit supply and establish that there is a relationship between risk and demand for trade credit. In paper five authors provide insight into the well-diversified portfolio construction for the investors participating in the capital markets of Pakistan. They used Bloomberg data for the period of 2009 – 2015, Sukkur IBA University is proud to house about 12 terminals of Bloomberg to facilitate the students for enhancement of their classroom learning and faculty for their research. This paper identifies that 20 stock portfolio is optimal in diversifying the market risk prevailing in the Pakistan Stock Exchange (PSX). In the last paper, authors investigate the trading behavior of the investors to know the impact of the demographic and financial factors on their investment activity along domains of fundamental, market events and personal factors. The findings suggest that the investor’s self-confidence is a function of changes in both market and personal factors, whereas, overconfidence leads investors to hold big portfolios. The journal is a sincere effort of Sukkur IBA’s unmatched contributions towards commitment of producing high impact research in fields of economics and finance to cater the needs of country’s developing economy. SIJEF is aimed to produce high impact original research finding on any of the journal’s thematic research areas. I look forward to receiving your submissions for upcoming ensuing issues of the journal and valuable feedback to improve the quality of publications in future.